Everybody wants to be a little bit skinnier! 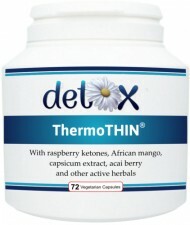 A thermogenic fat burner / fat metaboliser and our most powerful slimming formula! This improved version (KETOburner) contains raspberry ketones, African mango and cinnamon, as well as all of the original active ingredients, which include capsicum extract, acai berry, green tea and guarana. This concentrated powerhouse combination, formulated in line with the latest in weight loss research, contains proven and well-publicised ingredients to help boost the body's metabolism, support digestive health and maintain lean muscle mass. Contains no: ephedra, gluten, excipients, wheat, lactose, added sugar, artificial colourings or yeast. Contains caffeine and other natural stimulants. Not suitable for people who cannot tolerate caffeine or herbal stimulants. If the user is unsure if they can tolerate natural herbal stimulants, use our other weight management products, such as Fat Grabber (a chitosan combination). 6 days in a row; no capsules on day 7. First-time users: Take only half the number of capsules for the first 4 days.